Radio is an audio compass; the radio antennae, a divining rod. Positioned anywhere, it opens an exclusive window directly into the location in which it sits. Signals received on the Medium Wave (AM) and FM bands reveal programming intended for a local population by governmental, independent, "pirate", or corporate media broadcasters. Anything from low-powered ethnic minority transmissions, high-powered westernized pop stations, and omnipresent state-run radio can be found on these bands. Shortwave bands expand the breadth and scope – pulling in regional and international receptions. Everything received factors into the experience. Music, news, talk shows, advertisements, station IDs, cross-phased interference, errant or intentional static-generated sounds, distant detritus and random broadcast anomalies all become equally relevant. 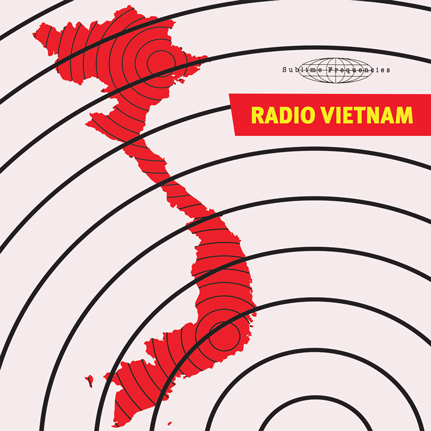 This disc continues the Sublime Frequencies locale-specific radio collage series with Vietnamese radio recordings culled and assembled from signals received in Hanoi and Ho Chi Minh City between December 2013 and November 2014. Inside the program are moments of outstanding folkloric, traditional and pop music – including performances on the electric guitar and the dan bau (one stringed guitar-like instrument), eclectic Vietnamese folk and rock stylings, dramatic effects-laden radio theater and musical segues, new wave pop forays, traditional percussion and vocal chants, news segments, dynamic radio bumpers, jingles and advertisements, comedic interludes, phoned-in karaoke sing-a-longs, English-language programming, early-morning exercise regimens, and coded messages from the outer ether. The grand total sum of these radio recordings doesn’t aim to present a certified ethnographic study of contemporary Vietnam. Rather, the material here aims to distill and replicate the excitement, engagement and discovery gained during heavy exposure to Vietnamese broadcasts over an eleven-month period during the teenage years of the twenty-first century. CD comes in a beautiful digipak with full color images, a booklet and liner notes by Mark Gergis, who recorded, compiled, sequenced and produced the project for Sublime Frequencies on location in Vietnam.